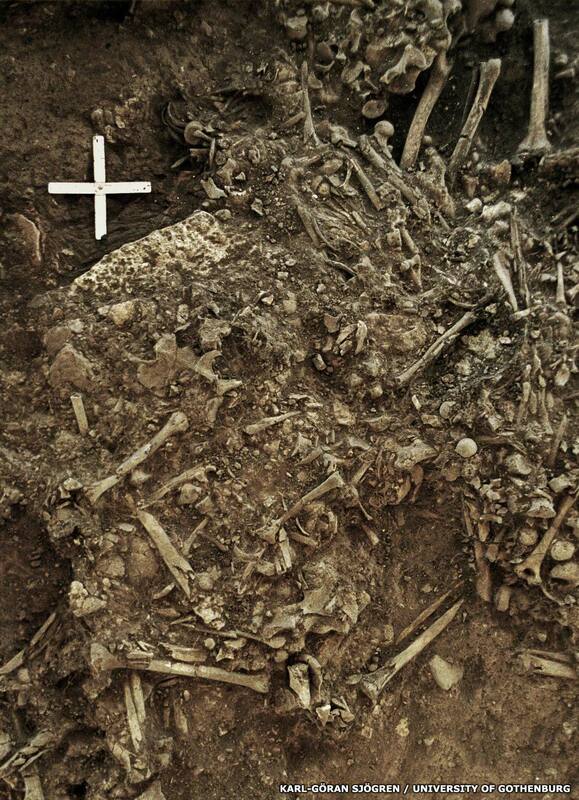 The remains are shown here of a twenty year-old woman (Gokhem2) who died around 3700 BC, killed by the earliest-known plague pandemic which itself likely led to the decline of Neolithic societies in Europe. The plague was down to a new strain of the bacteria, Yersinia pestis, which was found in the DNA of its victim. The farmer cultures of Old Europe underwent a rapid period of decline from about 4000 BC onwards. The new super towns of the western Black Sea region contracted and sometimes disappeared entirely, and the previously unbreakable cultural barrier between Old Europe and the horse-riding cattle herders of the Pontic steppe broke down. Original text copyright © P L Kessler and the History Files. Image copyright Karl-Göran Sjögren / University of Gothenburg. A photo page for the History Files. Go back or return home.